We had just climbed the Brown-Patey over two days and needed some rest in the valley. Unfortunately (for our legs) forecast promised three sunny days before stormy period. You just have to use these windows if you want get something done. 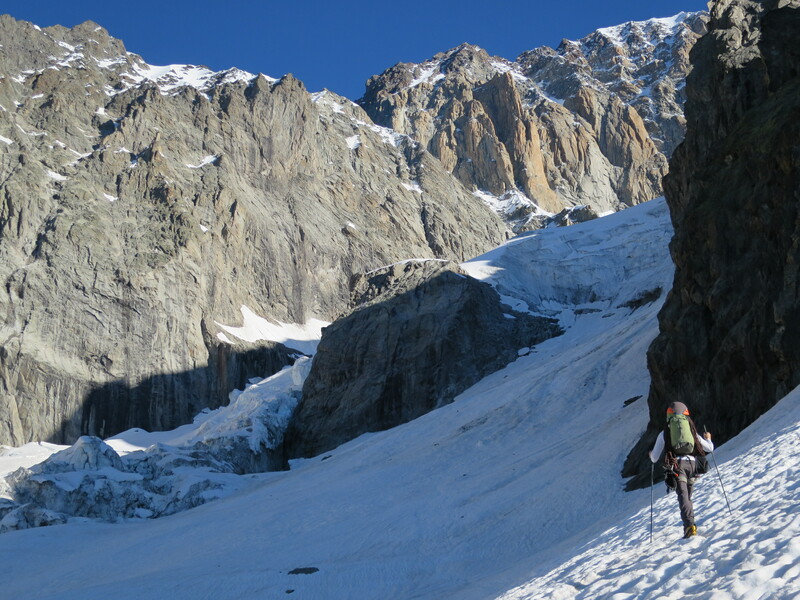 Tim’s friends had climbed the Bonatti-Oggioni few days earlier and they reported icy chimneys high on the route. We figured out that couple of days with freezing level around 4500m would melt the ice away. Bonatti-Oggioni and the never-ending Brouillard ridge. So, on the 19th of July we drove to Val Veny and started hiking upwards at 5am. It was actually really pleasant six hour walk to the Eccles bivouac. We heard that huts were full the previous night and people had to sleep outside. Fingers crossed! The lower hut was already full, but we got places from the upper one. Bob and Lee from Wales shared the place and the idea of climbing the Pilier Rouge with us. Tim just about to reach the Brouillard glacier. Mont Blanc’s S side is wild! Good food at the bivouac. 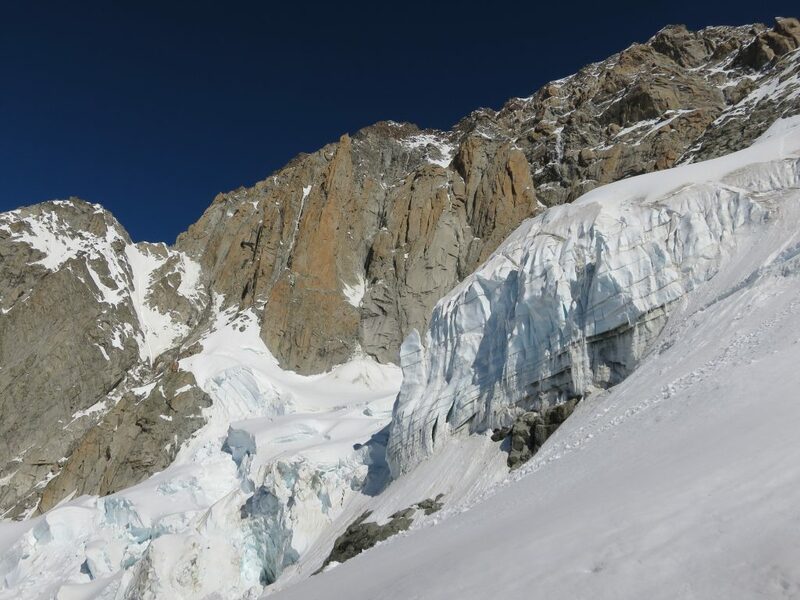 Mont Blanc’s S face truly is a remote arena of high altitude rock and ice climbs. Good looking lines everywhere! In my opinion, after GJ’s N face, this is the thing in the massif. Pilier Rouge du Brouillard itself stands out as a biggest tower above the Brouillard glacier. Who wouldn’t want to climb that? 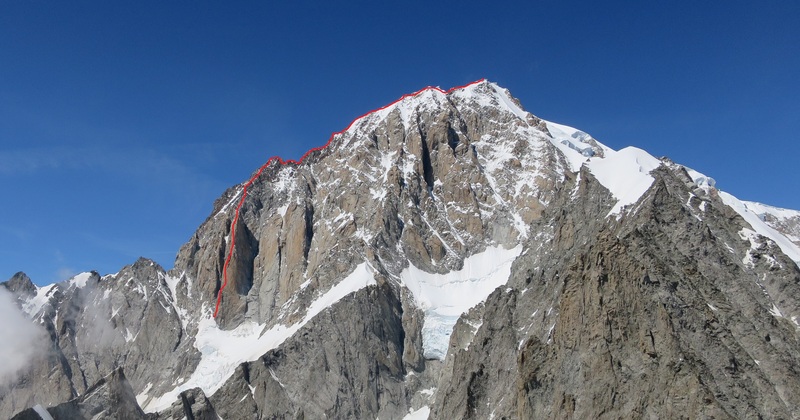 Bonatti-Oggioni follows a line of weakness venturing up the pillar on it’s left-hand side. 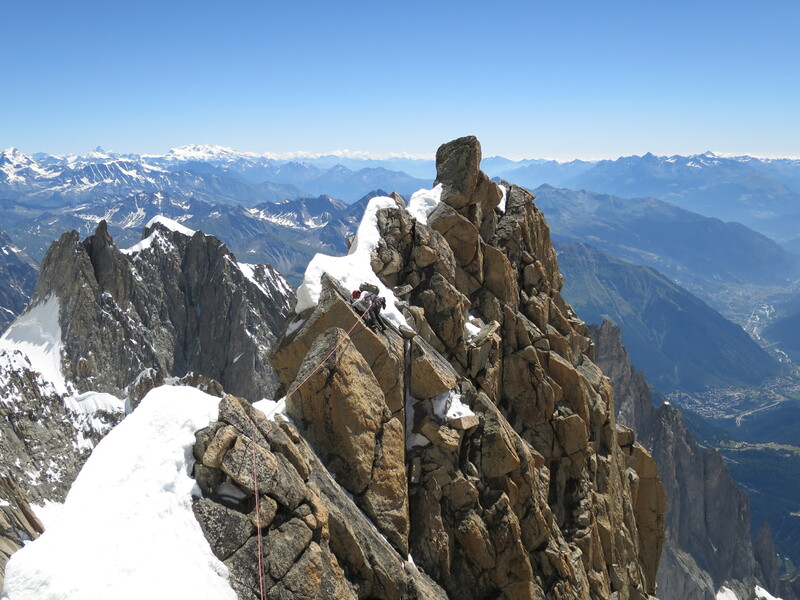 Once you top out the pillar there’s still several hours of loose ridge climbing to be done before the summit of Mont Blanc. 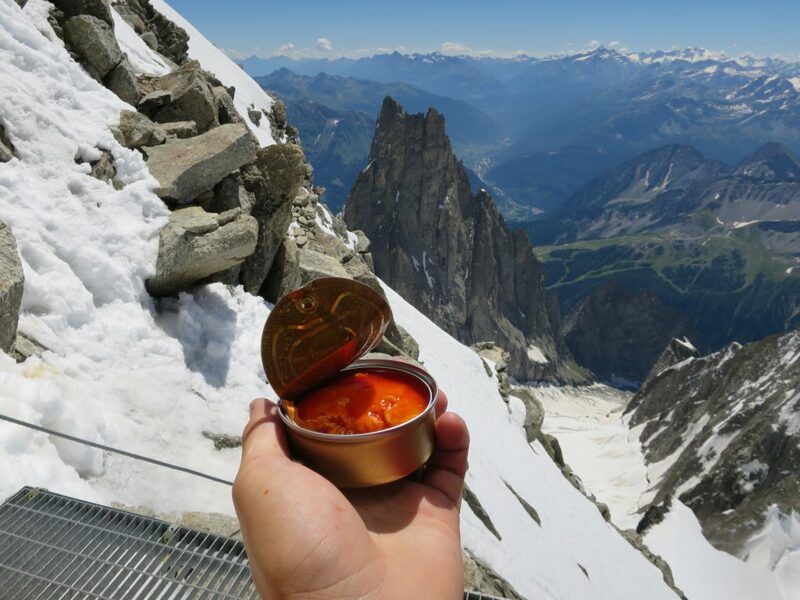 A perfect mountaineering route. On Wednesday morning team Wales left at 4am and we started an hour later. Glacier to the foot of the route was nice and easy walk due to amount of snow this summer. We catched the boys at the first bolted stand and climbed rest of the day just behind them. No route finding pressure for us then! 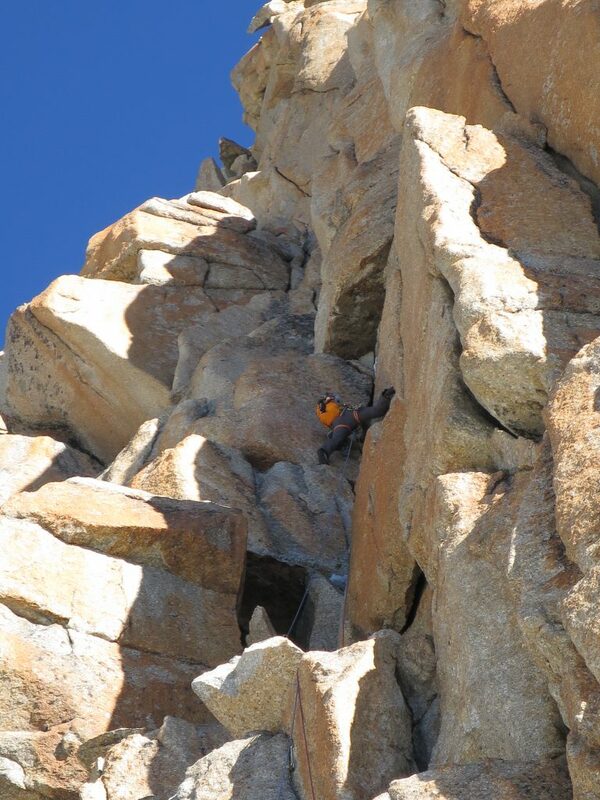 The first proper pitch is a nice 6a crack, which wakes you up. I somehow managed to fill my pack with heavy stuff and leading the wake-up pitch felt a bit odd as a first thing in the morning. 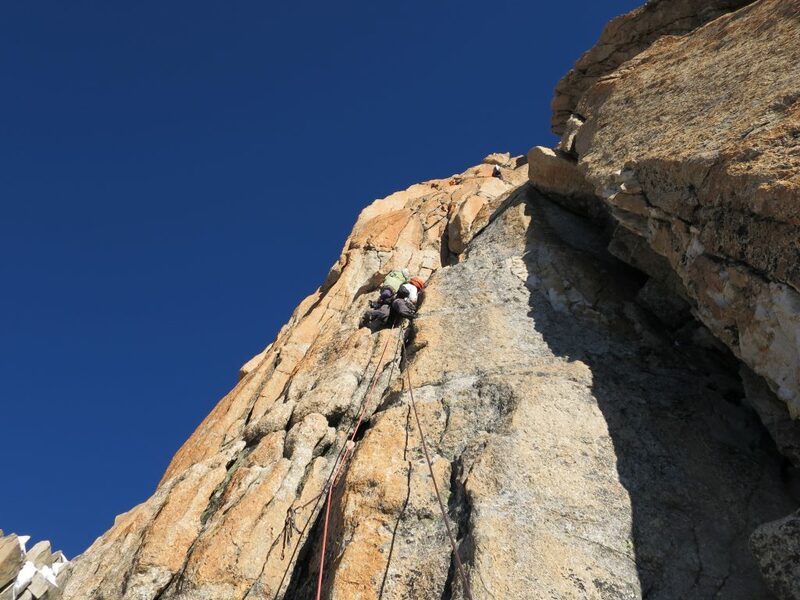 We changed leads constantly due to easy route finding and climbing being well in our limits. Tim seconding the wake-up pitch. 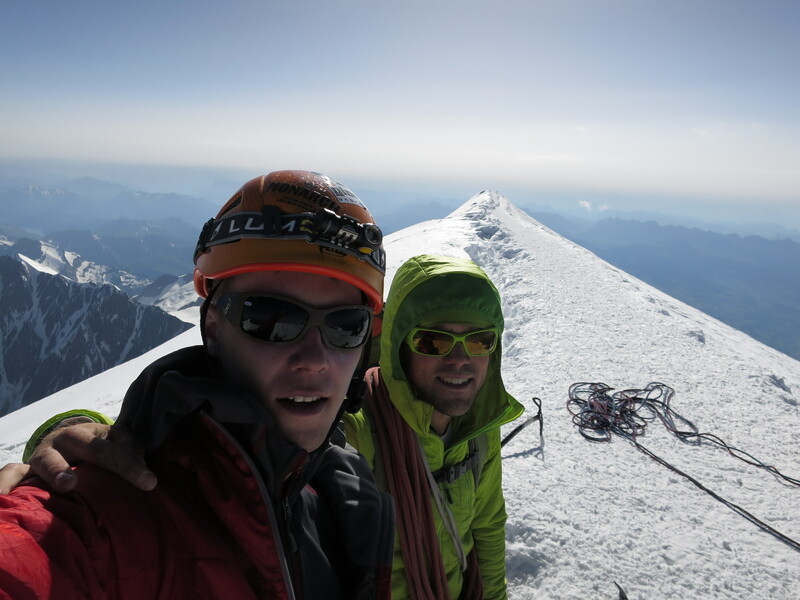 Excellent crack pitches followed each other and in 5 hours we topped the Pilier Rouge. 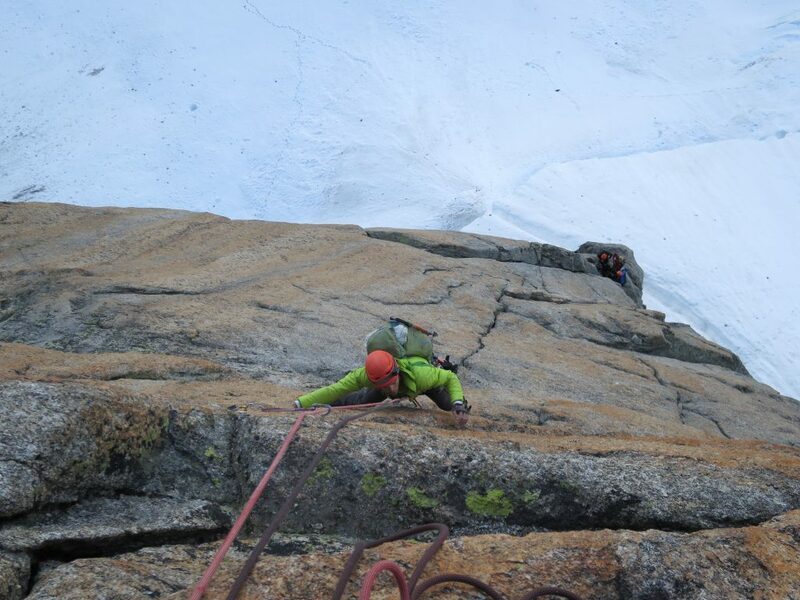 We did find some ice in the upper chimneys, but all in all it was good training for the Patagonia. Icy cracks. Bob from the team Wales leading. Tim traversing from the top of the pillar. From the reports of previous parties we knew what to expect after the pillar. It was back to crampon mood again. Some very loose ground led to the summit of Pointe Luigi Amadeo (4460m) where we stopped for a brew at 2pm. Brew stop at Pointe Luigi Amadeo. Brouillard ridge is loose, exposed and not very nice if you ask me. Views are great though, but it just keeps coming. Luckily the whole ridge was in good condition. 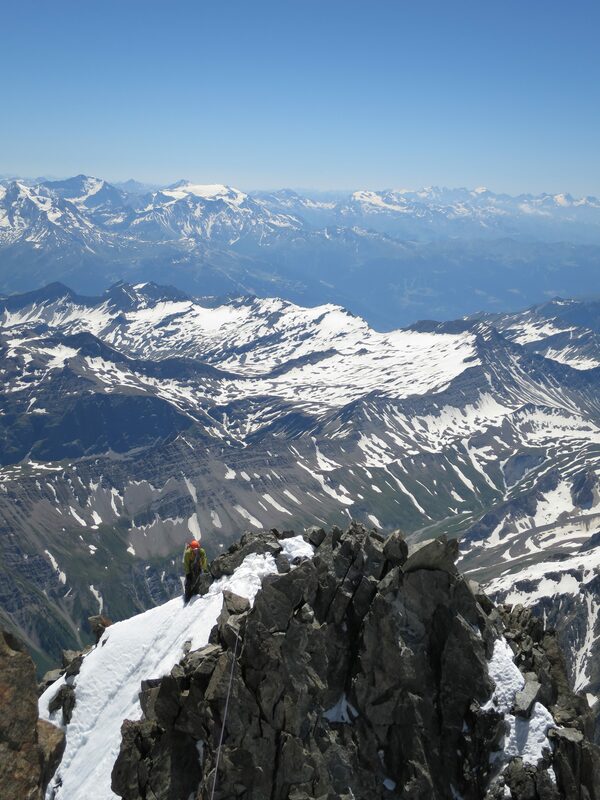 Quick pictures on the summit of Mont Blanc at 6pm and four hour downhill to the Nid d’Aigle refuge. 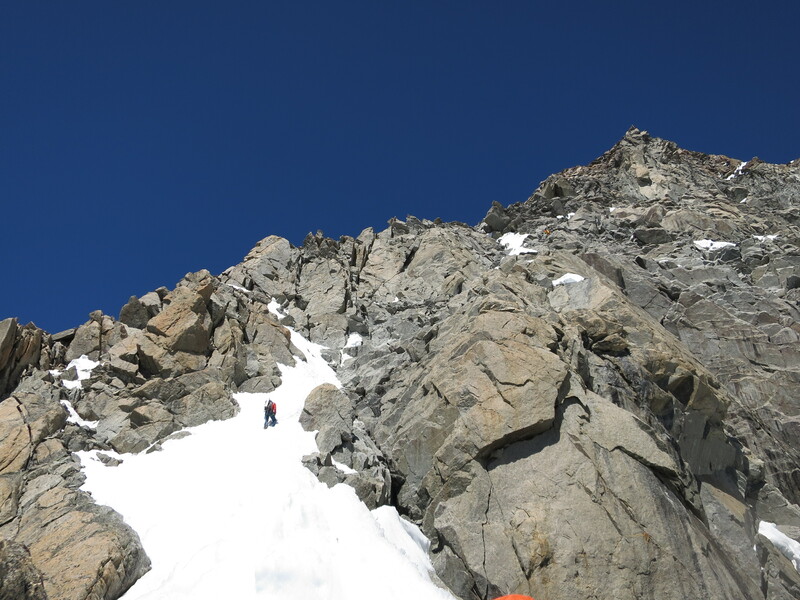 Crossing the death couloir was again, the scariest thing of the day. 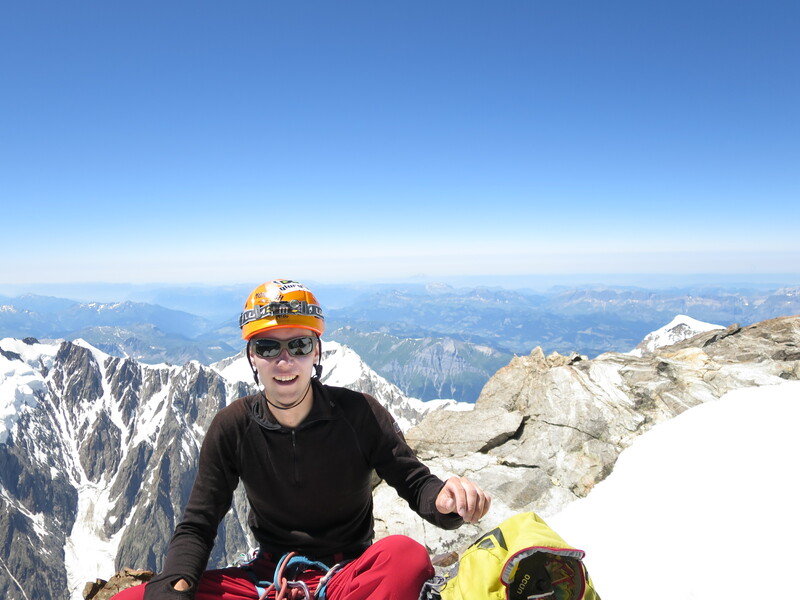 On the summit of Mont Blanc! Climbing the Bonatti-Oggioni proved to be a really fun way to summit Mont Blanc. Can’t wait to return to the south side!